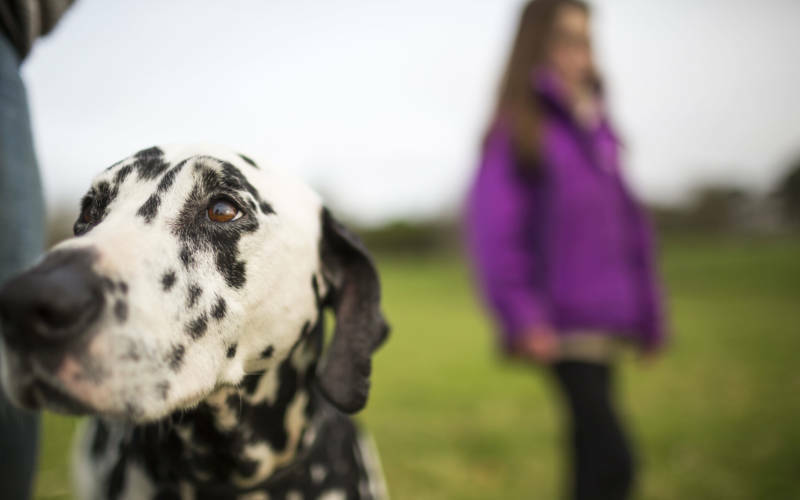 We know that dogs are a part of your family so in order to accommodate them, we’re allowing dogs anywhere in the grounds with the exception of the Aviary, Parterre and Woodland Playground. As not all our visitors are dog-loving people and to help protect our beautiful surroundings we just ask that you adhere to our dos and don’ts for bringing your dog. In advance of your visit, please note that all dogs (excluding assistance dogs) can be walked to and from the visitor car park. This walk is approximately 15-20 minutes in each direction, on a woodchip path, with an uphill section at the base of the hill. At busy times, when visitors may be standing in the bus aisle, we may ask you and your dog to wait for the next available bus. If your dog might react to other dogs or people in a contained environment, please can you walk your dog rather than use the bus, to prevent any avoidable interactions. Please take responsibility for your dog and consider whether using the bus, rather than walking, will be in your dog’s best interest. In the event of a dog displaying any signs of aggression before entering the bus or having boarded, we reserve the right to request that you use the walking path. 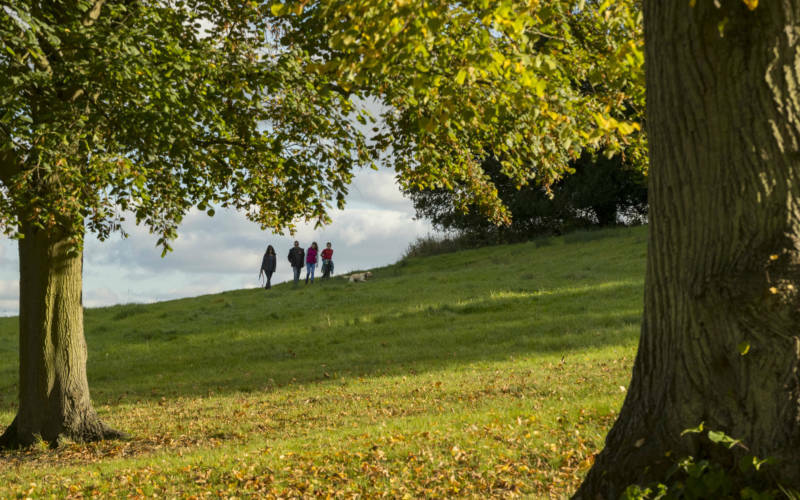 Use our online navigation for the walks or download our walks map in advance. 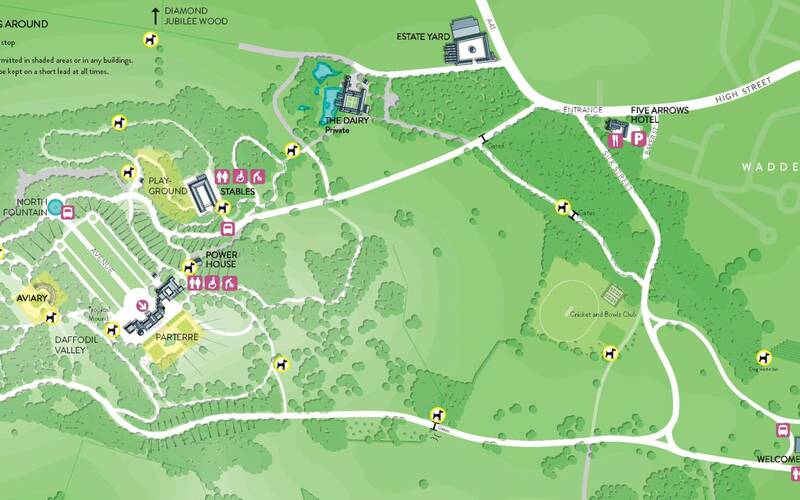 When you arrive you can also purchase an illustrated dog map with our walks for £2 at the Welcome Pavilion. 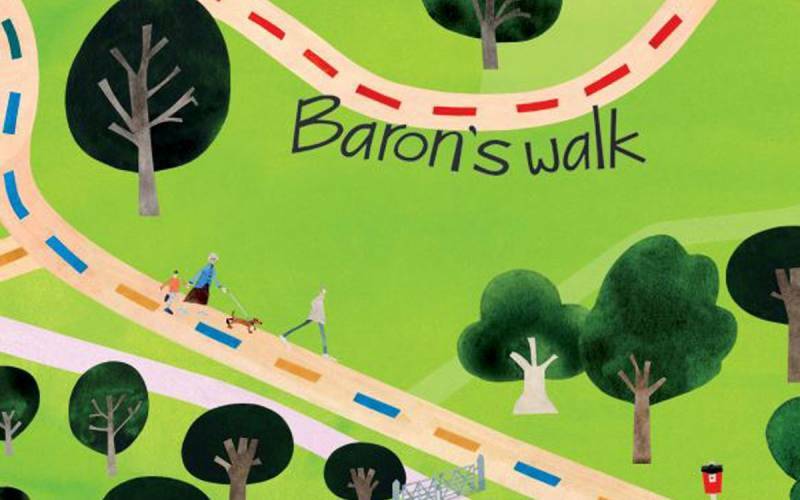 This keepsake map has been designed by artist Debbie Ryder and highlights some of the key areas you can enjoy with your dog. It is double-sided with a Mindfulness map on the reverse, designed by artist Bek Cruddace. Treat your dog to Poupon’s doggy bag. 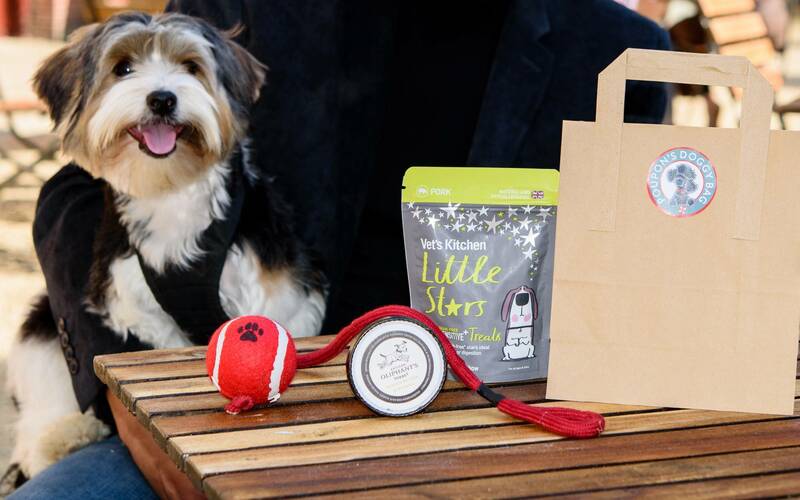 Play together with their brand-new toy while you explore one of our five dog friendly routes, offer them a tasty treat as you relax in the grounds, and watch them enjoy their own sorbet as you eat your lunch. £5.90 per bag. Buy yours in the Stables courtyard. 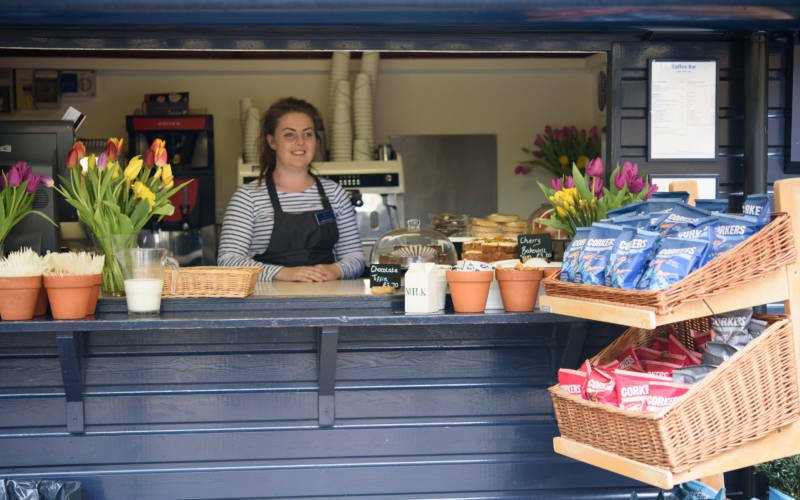 Bring your dog and grab a quick snack, freshly made baguette, slice of cake or a hot drink at our kiosk in the Manor Shop Courtyard. 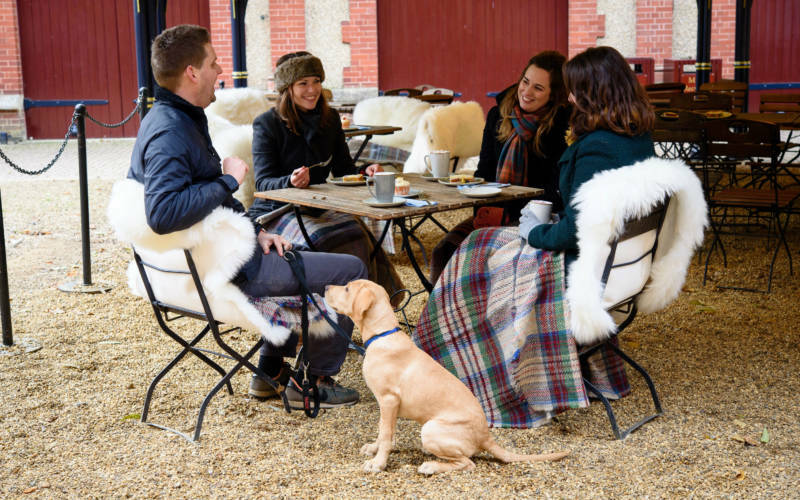 Near the Woodland Playground, the Stables courtyard is informal and ideal for dog owners and families. A short walk from the Manor, with a food and drink kiosk and outdoor seating. 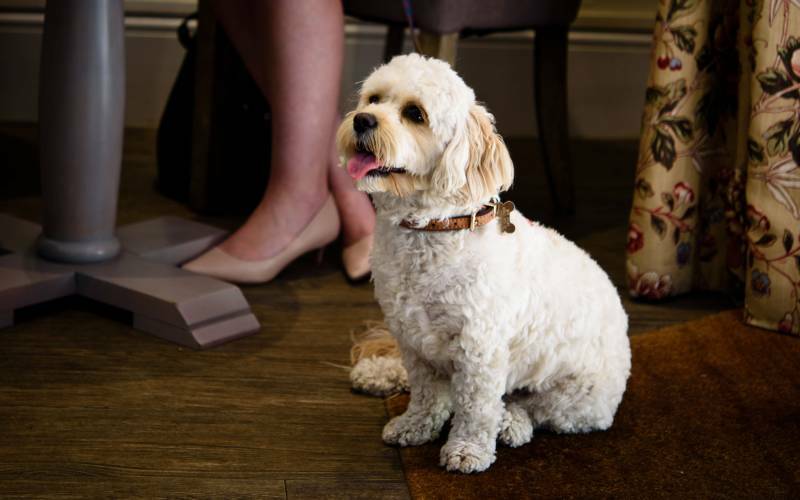 If you would like to dine with your dog indoors, you’re very welcome to in the bar area of The Five Arrows. Dog treats and attention are always on the menu at the hotel, and you can even enjoy a stay with your four-legged friend.